Taste test: This bar consisted mostly of Special K cereal, held together by something sugary, with some bits of strawberry visible inside and a sprinkling of a white icing on top. The taste was on the sweet side, far sweeter than a bowl of Special K with strawberries and milk, but not over-the-top sweet. 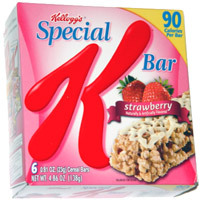 Not a bad bar, but I don't think it's really much of a cereal bar, more like a very sweetened granola bar. Smell test: Strong, sweet real strawberry smell, pretty good.